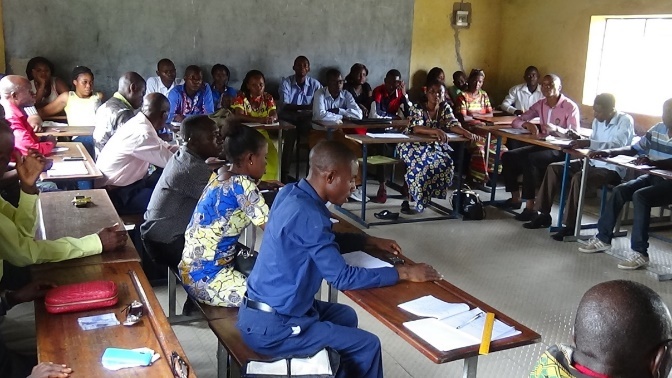 On December 16, Dr. Jerry and teachers from the College des Saviors, Kapini, and Lukunga schools convened their last Teacher Learning Circle (TLC) of 2017 to reflect on what they had learned in 2017 and what they looked forward to in 2018. Present at the meeting were also guests from the Education Ministry. To begin, they discussed the quantifiable numbers of 2017: seven small group teacher meetings, six large group meetings, and three schools involved. At each meeting, teachers shared best practices, discussed classroom issues, and brainstormed solutions. Then they discussed the equally important, harder to quantify impacts of the Teacher Learning Circles: inspiring a fight against erosion in the Kapini’s school community, mentorship, improved teacher-student rapport, socialization, and the reinforcement of school curriculum. The compounding impacts of things like better teacher-student rapport made even larger waves, changing the very way that students and teachers related to one another, and in some cases, even changing the styles of teaching for some. Before participating in the TLCs, one teacher was known for his saying: “everyone for himself, God for all.” But throughout his participation, he began to find ways to teach to students at all performance levels, not just to students who were already strong academically. “Through the learning circle, he developed the group spirit,” Dr. Jerry remarked. Teachers became more comfortable with students, less strict, and more open to new teaching methods, and in turn, students gained confidence, learned how to communicate with adults, and looked forward to attending school. Attendees also highlighted potential areas for improvement in 2018, desiring to disseminate reports from the TLCs and to find a way to bring the message of the TLCs, and the curriculum its built around, to a larger audience. One of the visitors from the Education Ministry suggested starting a newsletter to report on TLC meetings. Participants also gave an overview of the distinct student-centered, asset-based teaching program that has been in place at College des Saviors over the past five years. Many remarked how it has brought not only a new way of teaching, but a new way of looking at life. Goals for 2018 include sending a College des Saviors delegation to Lukunga school to help them with their student garden, as well as collecting more indicators about impacts to the students from the curriculum, including reading, writing, and attendance markers. To end the day, participants answered a reflection question to prepare for themselves for the new year. They asked themselves: how will you improve your teaching this year? After celebrating progress and planning for next steps, the teachers are ready to take on the new year. If you missed our blog post detailing what exactly is a Teacher Learning Circle, refresh your memory, here.